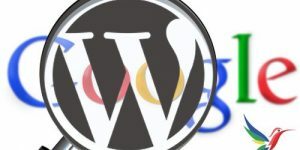 Now that’s we’ve covered how great WordPress is as a general CMS on the first page of this WordPress SEO tutorial let’s take a look at how WordPress should be setup to run as a SEO CMS or to make a general WordPress blog do better in the search engines (especially Google). This is called a dynamic URL and contains variables (?p=1 is a variable), when Google was first created their search engine algorithm couldn’t read URL’s like this, in layman terms you were pretty much stuck with URL’s lacking variables (meaning no question marks ?) simple URL’s like www.domain.com/page1.html. or many other ways to present your content. I used to use the top version because Google used to spider pages ending in html faster than those ending in php (Google assumed a page ending in php might be dynamic and slowed spidering) and I liked to see content pages ending in .html and archive pages like your Category archive to lack .html (just my preference, any of the above are good SEO wise and if migrating from a site using *.php the .php option might be easier to use: no need for 301 redirects). Note: the above is no longer true, Google doesn’t prefer .html and in 2016 (last WordPress SEO Tutorial Permalinks update) I recommend the second option (www.domain.com/awesome-site-on-keyword/ or www.domain.com/awesome-site-on-keyword there’s no real difference). To achieve this is easy, it’s a few clicks of the mouse for most WordPress users. 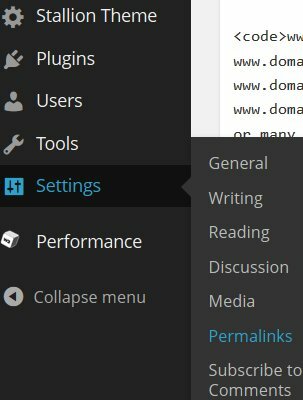 Under your WordPress dashboard in WordPress 3.8+ on the left menu find “Settings” and click the down arrow (you get this arrow by hovering over the Settings links and it will show to the right of the link) to open up more options, click “Permalinks”. On the new page the “default” box will be ticked if this is a new WordPress installation or you’ve never changed this setting. I also tended towards /%postname%/ for new sites as adding html was making multi comment paged post look messy (they work fine, but the URLs look messy). If this is a new WordPress blog installation (content not indexed in Google yet OR you don’t mind loosing current search engine listings) I strongly advise making this permalinks settings change, it will give your pages a small boost in the major search engines as long as you use relevant keywords (this is VERY important and covered later) to your content in your blog post titles. If this is an old WordPress installation and you currently have the default www.domain.com/?p=1 format (only for this format, not others) you can still make this change in WordPress 2.7+ and experience an increase in search engine rankings for your WordPress blog. The latest versions of WordPress now automatically 301 redirect the dynamic URL’s to whatever version you choose under these permalinks options: very impressed with the WordPress development team adding this feature (well done guys). That being said I have old sites using the /%postname%.html structure because Google used to spider html pages faster and to change it now would mean setting up a LOT of manual 301 Redirects (WordPress doesn’t 301 redirect /%postname%.html to /%postname%/ automatically) and a 301 redirect costs a little SEO link benefit, so to change permalink structure would cause SEO damage for no real SEO benefit. Generally speaking don’t change the permalink structure of an old site that’s indexed in Google, it will have a negative SEO impact (I would change this format www.domain.com/?p=1 but not others on an old site). This means if your WordPress URL’s currently look like www.domain.com/?p=1 and you make the permalinks change advised above Google will automatically know www.domain.com/?p=1 goes to one of the new page URL’s and your site will work when people come to your site from either type of link. This means you can make this change if your site is years old and since 301 redirected pages are not penalised in anyway in Google (there’s a small dampening factor on 301 redirects, but you do get the benefit from the keywords in the URL: SEO swings and roundabouts) your old search engine rankings and backlinks will transfer to the new page URL’s. I’ve made this change on a few old WordPress installations that had quite good Google rankings with good results. Please be aware short term you may loose some SERPs, but they will recover quickly (well under 6 weeks in my experience) and should improve after your WordPress blogs fully reindexed (this assumes you use keywords in the titles of your posts). Can be well worth making this change on a large keyword rich (where your posts titles are keyword rich) WordPress blog. Note 2: The WordPress SEO Tutorial you are reading now used to be on another domain, I managed to get the other domain penalized in Google: added a footer link from the Talian 5 WordPress SEO theme (theme I sell on the other site) to the old site this WordPress SEO tutorial was on, this per se wasn’t an SEO problem until Talian 5 became the go to WordPress AdSense Theme for autobloggers and it was used on tens of thousands of WordPress autoblogs. Even though the footer link could be turned off (tick one box and it’s off) on the Talian 5 options page many (and I mean thousands) left it on and I have millions of backlinks. SEO wise that’s great other than it’s millions of identical sitewide links from WordPress autoblogs which Google understandably didn’t like!!! Basically shot myself in the foot by generating too many backlinks. In Stallion Responsive haven’t made that mistake, if a user leaves the footer link on it’s a single home page backlink, not sitewide. So moved the WordPress SEO tutorial to here in Feb 2014 and 301 redirected from the old site to here. Note: WordPress SEO tutorial 2014 the information below is no longer valid, WordPress solved the issue below so using the best permalink structure advised above is again recommended SEO wise (don’t you just love how things change :-)). I’ve had the above information on the site for about a year and recently discovered I made a mistake on advising the above without adding a warning. WordPress works in a way that it reads a URL with the format www.domain.com/%postname% (and the similar structures I advised) by looking for WordPress Pages (the static Pages) first because they have the same structure. If you have a WordPress blog with a lot of static Pages having a permalink structure like www.domain.com/%postname% for your blog Posts can slow down WordPress generating a blog Post link URL under some scenarios when a visitor accesses your site (it’s because WordPress Pages use the same URL format). I’ve been using this structure on many sites for years (sites with thousands and even tens of thousands of posts), with no obvious problems, though I tend not to use many static Pages. As I understand things as long as you don’t have lots of static WordPress Pages (static Pages are like the About page) the impact is minimal on the average WordPress site. This is not ideal SEO wise as it adds the posts ID number to the URL which won’t help with SERPs. It’s not a massive SEO loss, so if you plan to have a lot of static Pages consider the above. When I make new sites I’m using /%pageid%-%postname%. Will still get to the right page (as long as /%post_id% is in the URL it works). Note: the above is no longer valid, left this information here for those who find the above advise on other sites and think in newer versions of WordPress you should add the post ID into the URL structure.. The benefit of this is all the Categories of this WordPress blog will now have a small boost for search results related to responsive without having to even use the word responsive in the content (that’s how Google works). It’s only a small boost, but every little bit helps. so choose a word or short phrase (phrase format is hyphenate – keywords: responsive-theme or travel-articles etc…) that has relevance to the majority of your WordPress content. The other optional “Tag base” should ideally be left as is, this controls the URL’s of your tags. Social networking sites like Technorati look for sections with a tag URL to index, so you don’t want to change it. With a box below it with some code, these are WordPress .htaccess rules that use mod_rewrite to rewrite your WordPress URL’s from dynamic looking to static looking. This will make life so much easier. Download the file above and unzip it, inside you’ll find the .htaccess file. Upload the blank .htaccess file to the same place you uploaded your wp-config.php file using a FTP program like Filezilla. Just to make our lives a little more difficult some FTP programs don’t show the .htaccess file after upload, (it’s considered a system file!) so if you can’t see your new blank .htaccess file after upload use Filezilla which does show it by default (it’s free and better than many commercial FTP packages) or follow method two (see below). 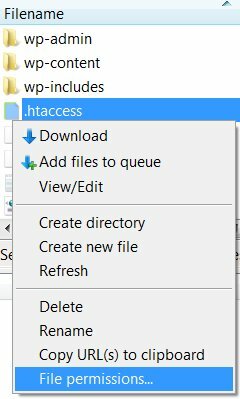 If you can see the .htaccess file in your FTP program we now need to change the .htaccess files permissions so WordPress can edit it. In Filezilla after uploading the .htaccess file we do the following, first click “View” followed by “Refresh Views” (F5 does this as well) on the file menu (if you miss this step sometimes the permissions box has a bug on newly uploaded files and no tick boxes are ticked!). 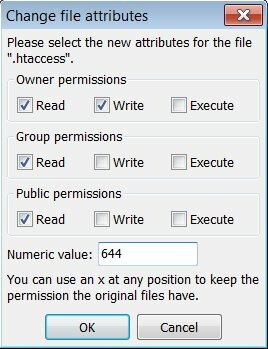 Next “right click” the .htaccess file you’ve uploaded (in the right bottom pane window) and select “File Permissions”. In the new box tick all the boxes so it says 777 in the “Numeric Values” box, click OK. This gives WordPress full write access to the file so it can make changes to it. If you use another FTP program there will be a similar way to change file permissions. Go back to the Permalinks settings page in WordPress and click the “Save Changes” button again, if you’ve done everything right the writable warning and the box with the code in it will disappear and WordPress has written those .htaccess rules to your blank .htaccess file. Check your WordPress blog to see if everything is working correctly. If it’s working change the permissions back to like you see in the image above, leaving the permissions at 777 is a potential security risk. Save the .htaccess file and upload the file to your websites server using FTP (Filezilla etc…) to where your wp-config.php file is. No need to save changes again on the permalinks page this time. Check your WordPress blog to see if it works with the new URL structure, if it does you’ve done everything right. This gets us to a WordPress blog with SEO friendly URL’s. I know the above sounds like a LOT of effort, but the truth is this takes a few minutes at worst in practice. Assuming everything went to plan your URL structure is SEO friendly, you have SEO URL’s. There are on page SEO factors that can pass you a little SEO juice and optimizing your URL structure for better SEO is one of them. What I am going to talk about here is to pass on some instructions on what factors that you need to focus on while optimizing your url. Try to use static URLs over your site rather than dynamic and script driven URLs that keep changing over a period time, reason is simple when you have dynamic URLs in your website, the URL that will be indexed by the search engines may differ from the prefered url. That way you cannot effectively build links back to your site and also there is chance that search bots may find that your URL is keep changing and they might well in fact not index your URL at all. If you do have this problem set a prefered canonical URL. Keep your URL precise and one that gives you an idea what information that the URL may hold. Don’t use keywords in the url for a page that doesn’t really relate to the keywords used in the URL. Also you need to use keywords, but as mentioned before use your keywords correctly instead of spamming them in your URL, when you use the right keywords they have influence over your rankings. Use hyphens in the url to separate the terms rather than any other separators or no separators at all, next best to hyphens is an underscore. Try to keep your url structure as simple as possible, you can avoid the usage of words like “of, and, if” etc.. in your URLs and make it look more cleaner for search engines and also users. Hi, I’m using seo yoast, I published a page and I want to change the slug and also the title. How can I do it without to get a 404 error? And what if I want to change the permalink of an article I published in the past? The blog is new but I sent a sitemap. Thank you so much! Changing the WordPress title or Yoast Title Tag will have no impact on the URL of the post or page, but changing the slug will. Changing the post/page slug changes the URL, hence the 404 errors and currently WordPress doesn’t have a built in feature to automatically 301 redirect changes to post/page slugs. If this is a one of slug change (not going to change dozens of post slugs) a single line in your .htaccess fill will fix the 404 error and conserve any link benefit (most of it anyway) sent to the old URL. Add the above to your .htaccess file changing the two URL parts, the first part is the old filename location (entire URL of the old post minus the domain name), second part the full URL of the post as it is after you changed the slug. If you plan to make a lot of changes consider a redirect plugin, there’s plenty of free WordPress redirect plugins. 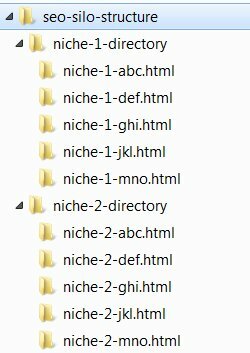 Where I’ve moved a significant number of posts from one site to another I’ll use a redirect plugin rather than the .htaccess file solution.